Hello all! I am new to this site, but I wanted to share my unusual setup, and my surprise that I have not seen a single other eGPU build based on used PCIe backplane expansion systems like mine from Cyclone Microsystems or Magma. If you do go searching around, be SURE you're looking at PCIe, not PCI. Because my cMP has native PCIe slots (Apple, what were you thinking getting rid of those?!? ), compared with what I am seeing about having to run drivers and crazy shenanigans to get the TB ports to talk with the PCIe slots on others' eGPU builds, I was surprised to find that all I needed to do was plug the host bus adaptor into the second x16 slot on my Mac Pro motherboard, plug the molex cable into that, and plug the other end into the backplane, apply power to the backplane, plug my GPUs into the backplane, and boot the computer! Because this is a managed/actively switched PCIe adaptor, the OS only sees the PCIe slots as an extension of the existing PCIe bus, just like plugging a USB hub into a USB port! Also, with a little bit of shopping around, these rare backplanes CAN be found for less than the price of the AKiTiO boxes and other such contraptions. Of course, if you have a nMP ("trashcan") or a laptop, you'll still have to go through the process of getting your AKiTiO box up and running via your Thunderbolt port, but once you do, you can further extend that SINGLE PCIe slot into an entire array of GPUs. There is one backplane currently available on ebay for only $100 more than I paid for my 5-slot ATX sized board, which can run up to 16 GPUs if you went single-slot on your GPUs or used riser cables to extend the PCIe slots. I'll post some more current photos later today, but here's a link to a PDF I put together that's about all the upgrades I did to my classic Mac Pro 5,1 - not just this eGPU addition & . I have since added the M.2 boot drive and added more GPUs to my rig, but other than that it's about the same. Interesting setup you have there! Makes me wish I could turn my ancient Mac Pro (2,1) into something more useful! Hoeveler, this is great stuff. Thanks for posting. The backplane manufacturers haven't done a good job of getting the word out. This is a wonderful solution that not many people are aware of. Thanks! I think these backplane manufacturers don't want to cannibalize their $3000+ turnkey system sales. What I built for less than $500 they sell for $3000 and up. I just discovered yesterday that a seller on ebay has released "over 10 available" of these hard-to-find boards. Here's the link: http://www.ebay.com/itm/262895086097 NOTE: this model of board is the big brother to mine, and will hold 8 GPUs. BUT in addition to the host bus adaptor card, you'll need this daughter card: http://www.ebay.com/itm/262885434236 There is another model as well that can hold 16 GPUs IF you set it up with riser cables and such, to route the slots out from under the single-slot mounted slots. For anyone who's already built an eGPU rig from the guides on this site, keep in mind that you should view this as an extension of what you already have. What I mean is that if you put the host bus adaptor card into your PCIe slot on your eGPU, then you should be able to further extend that signal out to the backplane and run up to 16 MORE GPUs for GPU rendering. Thanks for the post and info. I'm not quite as interested in eGPU applications specifically as I am simply having some more PCIe slots for my Mac Pro to utilize. So I found your thread via search. I'm looking all over eBay to try to locate the components you listed, but there are very few PCIe2-426s (and they are closer to $200), and no PCIe2-427s or Molex X16PC cables. I also cannot find many (or any for the latter 2 items) completed listings w/ these components either. Did you acquire and assemble these items a while back? Any suggestions on other places to find them? These are indeed somewhat rare to find on ebay. However, you're in luck, since there are a bunch of similar backplane available right now on ebay that have 8 slots, but the only catch is they aren't the ATX size, but are more server size. Also, that seller has a bunch of the host adapter cards... One more catch with this larger 8-slot board is that they need a daughter card that goes into the backplane. It doesn't have the molex receptacle built in like the ATX size one does. Take a look at the block diagram from this page and make sure you get all 3 parts, not including the cable. Thanks, hoeveler, for the quick reply! Yeah, I was looking at those linked from your 3/15 post, but I think those would be overkill and overly large for what I'm wanting, not to mention more expensive, due to the higher cost of the board plus needing the extra "daughter card". This is more of an enthusiast/prosumer-level build than something all-out professional/industrial...I really just need an extra slot or 3 because mine are full, so a smaller ATX form factor in a reasonably sized case like you did is what I'm after. Hey Hoeveler! Well, it took seemingly forever, but I finally found and acquired a PCIe2-427 backplane and accompanying PCIe2-426 HBA. The x16 cable was actually the hardest thing to find w/o paying a ridiculous $300 for one. I got a basic case— not a fancy one like you, but I mainly wanted to keep it small and inexpensive. Also got a 600W PowerSpec power supply from Micro Center. I am configuring an installation of a PCIe2-427 & PCIe2-427 pair in a custom enclosure. When connecting the 427 to the host via the 426, I get a red power LED on the 427 board and my 10GbE card shows power, but I get no green link light on the back, and no host visibility of expansion cards connected to the 427. I have the main power supply 24-pin feed connected at J13, as well as the 4-pin processor feed at J10. ...I know that J11 is for PCIe card aux power (such as for a GPU), but I can find no mention of J9 anywhere. I believe this might also be referred to as “12V-3”. A photo on your site shows what appears to be an 8-pin power lead connecting to J9, but my standard ATX power supply doesn’t appear to have a matching connection…unless this is an *input* PCIe aux feed for J11 (I *do* have some 6+2 PCIe connectors on my PS). I have tried jumpering J21 and J22 as well to engage the resistors, but this doesn’t appear to change the behavior I’m seeing. Any idea what I should be connecting at J9? Table 3-3 on p11 suggests it's pretty important, as it supplies 12V to the baseboard. Sorry to be dumb about this...I don't normally build PCs from scratch, much less specialized boxes like this! Cyclone: The issue is that he needs to have a power supply connected to the 8 pin aux. 12V power connector (CPU pinout). The 8 pin connector (J9) supplies power to the on-board circuitry (hence the red power LED being lit). The main connector (J13) gets 12V to slots J1 and J2. The 4 pin connector (J10) gets 12V to slots J3, J5, and J7. The 8 pin connector (J9) gets 12V to slots J3, J5, and J7 and the on-board circuitry. The power distribution was setup to split the the 12V power across multiple power supply rails. FT: my power supply actually has two of those 4-pin CPU connectors as one “bunch”, nearly joined all the way to the connectors. I was using just one of them in J10. Should I undo that one and put the pair into J9? Cyclone: If the two 4 pin connectors are "gangable" with an interlocking plastic tab to create an 8 pin configuration, I would suggest doing that and plugging it into J9. That would give you 12v power to all the slots and to the backplane circuitry. When I did this, the external chassis powered up just as it was supposed to! My usage of the extra PCIe slots has varied a bit over time, but I currently have a pair of 1TB Apple/Samsung SSUAX in a hyper-fast 2TB RAID0, an eSATA card, an extra Radeon HD5770 that I had laying around (using a 2nd one in Final Cut Pro X gains me a little bit on render times...and using it in my external chassis legitimizes my presence on this thread, I suppose 😛 ), and a BlackMagic Intensity Pro capture card. Super cool to be able to do this! Thanks to hoeveler for his thread/input and Cyclone for their technical advice! Wow Fred, sorry I missed your reply back in November! I’m glad you got it working. I didn’t have the same problem because I was able to get my PSU connected to the backplane on all the connectors. @hoeveler , you're back & with impeccable timing. Given 10.13.4 sees Apple torch 82% of the TB eGPU.io builds, your PCIe bus extender build may get some users' attention. GPU performance has been scaling every GPU generation. By comparison, Intel's CPUs have had marginal performance increases. This older system would make a good barebones candidate to boot the OS & run multiple eGPUs for processing on an Apple platform, and bypass Thunderbolt altogether. Hey Hoeveler can you confirm how many GPUs you have gotten working and on which os version? I thought the current macOS will only address 3 total. Hi! I had one GPU internal to the cMP and 3 GPUs on the backplane. I would have been able to fit one more on the backplane but at the time it was mounted inside the Phanteks case. I’ve since moved the backplane onto a wall-mounted Thermaltake Core P3 case where I can fit one more GPU at the bottom edge of the backplane. so wait - you do have four gpus working? In what version of macOS? I had 4 GPUs working in OS X 10.11.6 El Capitan. But I have since switched this system over to Windows as my main machine because Apple kept changing everything and I have work to get done. 😉 I still have and love my cMP system as my file server and my wife uses that machine for Lightroom. I stopped bothering to force Apple’s old and awkward hardware to do GPU rendering. Hi, just wondering what GPUs you had working? GPU - single gtx 1080 Ti to use for deep learning. 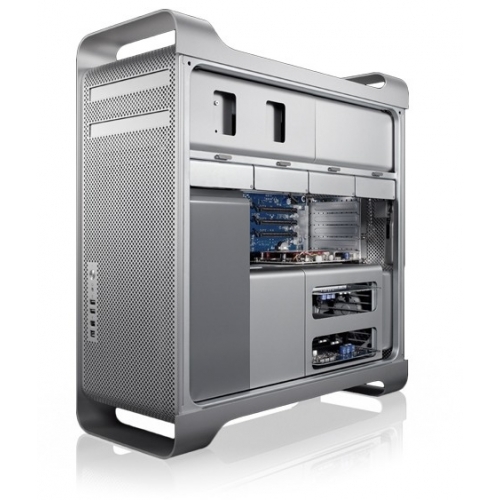 Host - OptiPlex 7040 desktop (Win 10, i5 6500U, Q170 Chipset), x16 slot with 16 pcie 3.0 lanes available. However, the SFF does not have enough space and power for the 1080 Ti. Connector - 50cm pcie cable x16 male to x16 female like this one https://www.digikey.in/product-detail/en/3m/8KC3-0726-0500/3M12026-ND/3641403 this is just a plain shielded pair cable with connectors, nothing fancy. I plan to plug the male end to my OptiPlex x16 slot, and run the cable out to my DIY enclosure with a 650w ATX power supply and cooling fans. Inside this DIY enclosure, I plan to plug my 1080 Ti into the female end of the cable. Will I be ok with two different powers supplies to my motherboard and my GPU? Will the MoBo detect the GPU if connected this way? Is there an order in which I need to power on the desktop and enclosure? Will 16 PCIe lanes beat the TB3 on bandwidth? Do I need any other cable apart from Pcie from MoBo to GPU? Seems simple and similar to the BTC miner setups that are so widely used. But then I am a noob, and request more comments from the experts here on issues that I may face. I have been reading scary stuff about two PSU rigs, and isolation and how small differences in voltage and input AC phase could knock out my mobo or card or both. Some people say use powered risers. Some say the powered riser should get power from PSU 1, others say it should get power from PSU 2 that also feeds the GPU. Not sure what to do, but got me thinking on a simpler option. What if I just replaced my sff enclosure and my puny 240w PSU with an ATX case with great cooling, and a 750w PSU with a great 12v rail etc. I only want 1 GPU for deep learning right now. Request your thoughts, @hoeveler and other experts. I have 3 GPUs now, all 1070s. I could easily put one more in and maybe two. Hi, I'm a little late to answer, but your solution sounds like a good one. There will be no problem using a second PSU for the external GPU. Just be sure that PCIe extension cable is shielded and intact and you should be ok. I should have read on to your other post here... This is a better solution... Just get a beefier PSU and bigger case and you'll have fewer headaches keeping it all neatly in a big case. Thanks @hoeveler , let me see how that goes. Will look for an ATX case with cooling, and around 700w power.